Given the deepening economic slowdown, is this the right time to start a new venture? Most of the professionals-turned-entrepreneurs in the world of advertsing featured say it is. Some of them even dismiss the slowdown as a phenomenon that will not, or only peripherally, impact them. Anusha Subramanian reports. It’s a trend that keeps cropping up every few years. Advertising professionals giving up high profile jobs at big agencies to launch their own creative hot shops is nothing new. What is new is the rash of start-ups in this year over the past year. This clearly indicates the plethora of opportunities in the industry. Also, many clients are unhappy with the structured bureaucracy, and the resultant delays and higher costs that they have to deal with at established agencies. But given the deepening economic slowdown, is this the right time to start a new venture? Most of the professionals-turned-entrepreneurs featured here say it is. Some of them even dismiss the slowdown as a phenomenon that will not, or only peripherally, impact them. Nevertheless, it is a fact that some FMCG, financial services, real estate and airline companies are paring their ad budgets. But the new kids on the block are not worrying. Here, we take a look at some of these new entrepreneurs, who obviously think the opportunities in the advertising market outweigh the risks. They are the newest kids on the block… so new that they still haven’t finalised a name for their agency, which is likely to be launched early next year after Dias serves out his notice period at JWT in January 2009. Says Padhi: “It is a good time to start out on our own as many clients are looking for specialised agencies instead of a full-service agency for their products.” That’s because the flood of similar products in the market is diluting their USPs. Doing innovative creative work—and not strategy and positioning, he feels, is the only way to differentiate one product from another in such a market, elaborating on the niche within the advertising universe he and his partner are targeting. And small they will be. The two, who have been good friends for over eight years—and professional colleagues at Leo Burnett between 1999 and 2005—will start out as a twoman team. “To begin with, we will do most of the work on our own and then build a team once we get good business. And initially, we will work with freshers out of college as they have an open mind and are more flexible than experienced hands,” says Padhi. A whacky, creative youngster, is how Kartik Iyer prefers to be seen. 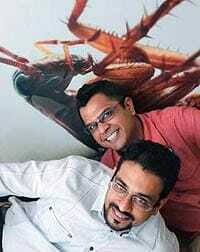 Iyer and Praveen Das, both former O&M-ites, teamed up to start Happy, a creative agency, in 2007. Interestingly, they had never worked together at O&M. “We just got along and did our first piece together—End of Season Sale for Lee—after we started Happy,” says Iyer. They’re “talking” all right. Happy already counts the likes of Lee, Thermal and a Quarter—a Rock Band, Nirvana Films, Dakshini Antiques, Radio One (project) and Dulux as its clients. Doesn’t the looming slowdown worry them? “Yes, the slowdown will impact clients and they will cut ad spends to bring down costs. But the Indian ad market is still big enough to support new players such as ourselves,” says Iyer. Happy’S USP: Specialist creative agency, ideating for any medium, with in-house capabilities going beyond writing and art direction to illustration, photography, voiceover, film making etc.